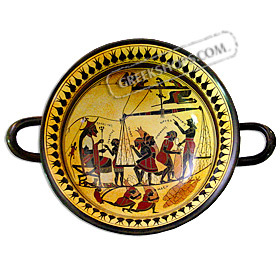 Hand-made ceramic copy of a Greek Corinthian Kylix from the Black Figure period of ancient Greek ceramic art, depicting a mythological scene. The original was made around 560 B.C. and features an unusual contemporary scene— King Arkesilas of Cyrene overseeing a group of workmen. The weighing motif suggests an Egyptian model, but the lively details and crisp decorative friezes make it a fine example of Laconian pottery.Approx. 20 cm in diameter (7.9").